Butternut Squash Soup with Cider Cream and Some of my Favorite Food Bloggers! A big steaming bowl of butternut squash soup is guaranteed to warm the body and soul. It is thick and velvety without any milk in it. That is thanks to the creamy nature of the squash when pureed. This is one of the healthiest soups to serve and perfect to start your Thanksgiving meal. Did you know that squash is a fruit? I find that amazing since it is usually considered a vegetable side dish on menus. Butternut squash has a sweet, nutty taste similar to pumpkin and can be used interchangeably in most recipes. The darker orange the skin is, the riper and sweeter the squash. Roasting it develops the flavors and is often the technique used in order to puree it for use in other recipes. You can also grill it for a nice smokiness. Today’s recipe blends butternut squash and apples, which lightens the consistency and adds another layer of complexity. It is important to use a tart apple such as Granny Smith to offset the natural sweetness of the squash and create a more savory soup. I love the addition of sage, especially for the Thanksgiving table because it complements the traditional seasoning of the turkey and stuffing. Apple juice and cider are similar but they have differences. Apple juice has been filtered and pasteurized so that it will stay fresh longer. It also often has sweeteners added. Cider is made from freshly pressed apples, unfiltered and perishable. Always store cider in the refrigerator. Depending on the quality of the cider you are using, you may want to pour it through a fine sieve to catch any larger particles of pulp and sediment. Leeks may be unfamiliar to many of you, but they are worth getting to know. Leeks are grown beneath the ground and tend to collect dirt in between the layers, which require careful cleaning. The dark green portions of the leaves are too tough to eat but can be used to flavor stocks and broths. See “Kitchen Skill” below for directions on how to clean them. The recipe calls for chicken stock, but if you want to keep this vegetarian, you can easily substitute vegetable stock. If you do, check the flavors and adjust the seasonings to your taste. If you have made a lot of turkey stock for the holiday, it would also be wonderful in this soup! The Cider Cream may be listed as an accompaniment, but I think serving this soup without it would be a crime. The combination of sour cream and apple cider is amazing and really improves the balance of the soup. I like to stir some into the soup before serving and also add a dollop on top with a sprinkling of chopped chives – it makes it look so professional! I know you are probably buried in preparations for your Thanksgiving feast, but I wanted to introduce you to some of my talented blogging friends. Check them out and I know they will be on your must-read list too! Enjoy their writings and recipes; I know they will enhance your holiday meal. Thank you all for visiting The Heritage Cook and sharing in my holiday preparations. I know there are hundreds of blogs you can be reading and I truly appreciate the time you spend with me. Tomorrow I will share some of my favorite recipes to help you create new ways to enjoy the leftover turkey, stuffing, gravy and vegetables. I wish you all a wonderful Thanksgiving! Butternut and other squashes are notoriously difficult to carve. To make it easier, place the squash in the microwave and cook for 30 to 50 seconds. This will soften the rind enough that you can cut through it without much strength. Of course having your knife as sharp as possible is also imperative. Use a steel to take off any burrs and to reset the edge before cutting the squash. Trim off the dark green portions of the leaves; discard or set aside to use for stock. Cut off the root portion and discard. Slice the leek lengthwise into thirds, leaving the root end intact. Rinse under running water, separating the leaves to dislodge any hidden dirt. Another technique is to fill a bowl with cool water. Slice the leeks as described above and swish the cut ends through the water. Leeks are so notorious for hiding grit that I usually take it one step farther and slice the leeks into rings and place those rings in the bowl of water. Agitate the water and let it sit to allow any grit to settle to the bottom. Carefully scoop out the leeks and add to soup or pat dry with paper towels if sautéing. « Thanksgiving Hints, How to Set the Perfect Holiday Table and Wild Rice Stuffed Mini Pumpkins! LOVELY soup, and thanks so much for including me on your list…I am so honored! I am happy to include you Winnie – I love your blog!! 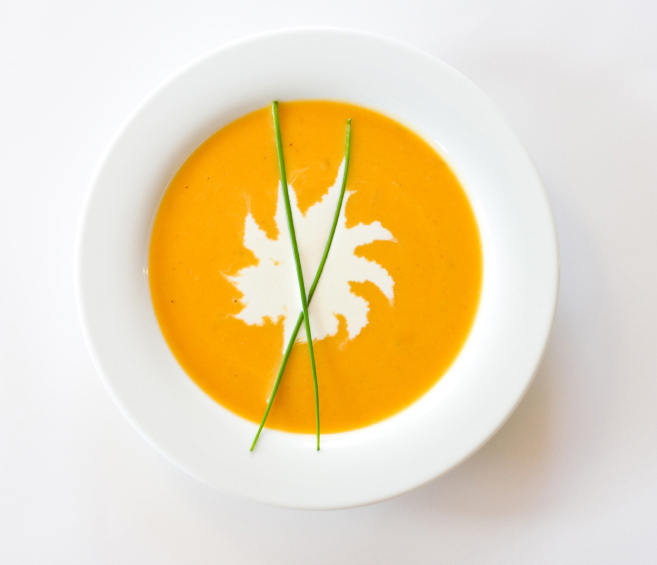 I love butternut squash soup – but I’ve never tried it with cider cream – what a nice addition (and I love the way you made that design on top of the soup). Thanks for the shout out, I feel privileged to be among these group. And thank you for all the work you put into your blog. You are so sweet Jeanette! I knew you would love this soup – my oh so healthy friend! I have been so into soups this fall from pumpkin, squash and potatoes and yours looks beautiful. I love the garnish; it’s simple and gorgeous. I thank you too Jane for including my blog in your list; I’m honored. Thank you Barbara – I am happy to have you in my list! Enjoy this soup, it is so good! Your squash soup photo is absolutely stunning, Jane. And I had no idea, by the way, that squash is a fruit. Happy Thanksgiving–and thanks for the shout out! I’m happy to introduce you to my readers Terry! Happy Thanksgiving! What an incredible recipe! It looks absolutely delicious (very professional indeed!). I had no idea that squash was a fruit, that is so interesting. And I love the addition of apples in here. Apple cider cream sounds so good! Finally, thank you so much for including me on your list of favorite food bloggers – I am so honored! You’ve totally made my day 🙂 Happy Thanksgiving! Thank you Katherine and you’re welcome. I’m glad you like this recipe – it is yummy! My pleasure Amanda – Happy Turkey Day to you too!